Mary Poppins Returns - What's in Store for Equities in 2019? Is the release of “Mary Poppins Returns” with its heartwarming messages a sign of better times to come and prevail in 2019? The original Mary Poppins was released in 1964, the year in which Martin Luther King was awarded the Nobel Peace Prize. With the release of the sequel, let us hope to see a globally accepted leader bring in peace after a terrible 2018 which witnessed a number of wars (civil, military, trade) and assassinations. From an equity market perspective, it was a terrible year for the broad indices. While the S&P BSE Sensex was up by 7.2%, the S&P BSE Midcap index was down by 12.5% and S&P BSE Smallcap index was down by 22.9%. 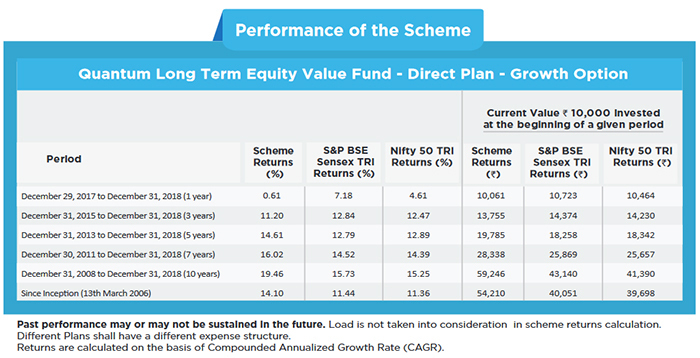 Quantum Long Term Equity Value Fund generated a return of 0.6% (See Table 1 to view complete fund performance) and despite the decline in the indices, it had a satisfying year as it grabbed the opportunity presented in October when stock prices in the financial sector declined. For the year, it stood out well within the value category of funds. The 10 year government bond yielded 7.3% at the start of the year moved up to 8.2% and then was back to 7.4%. 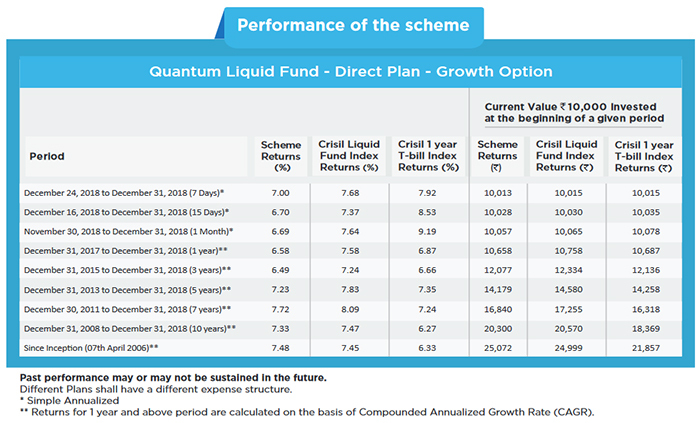 The Quantum Dynamic Bond Fund from Quantum Mutual Funds returned 4.1% while the Quantum Liquid Fund returned 6.6% (See Table 2 & 3 to view complete fund performance). Real estate in general was lackluster with downward trend in prices seen in some cities. Art also possibly suffered as liquidity crises post the IL&FS debacle did affect that asset class. 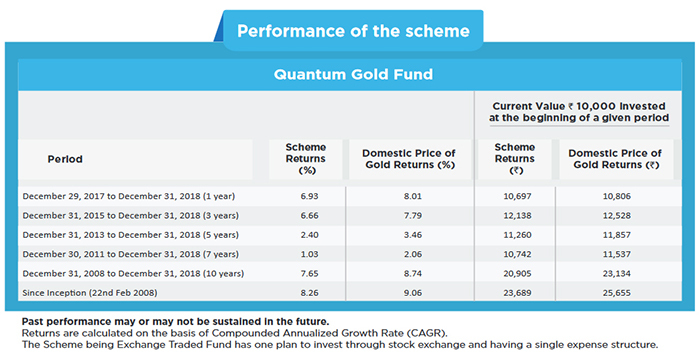 Quantum Gold Fund returns was at 6.9% (See Table 4 to view complete fund performance). Mr. Nilesh Shetty is the Associate Fund Manager effective from March 28, 2011. Mr. Pankaj Pathak is the Fund Manager effective from March 01, 2017. CY 2019 may be a difficult time, based on the poor political and macro-economic environment. The Stock markets may see a sell-off as fears over political instability and macro-economic drift will frighten short-term money. Inflation is likely to pick up as government spending increases. Capacity utilisation increase with no increase in capex plan will also result in inflationary pressures as supply reduces. Increase in interest rates may be curtailed despite fears of inflation as India heads into election and there may be government pressure on the banking system to keep the interest rates low. Fears of inflation and no increase in interest rates may see the currency decline further by 5 to 10%. Over the next few months the focus will be on election outcomes. Any disruption due to unexpected outcomes will likely be another opportunity for the analysts and fund managers at Quantum Asset Management Company. Needless to say that, they continue to remain focused on the fundamentals of the company and will take advantage of any jolt in the market by deploying the remaining cash, rebalancing the weights and recommending further increase in your capital allocation. As an aside, we would like to commemorate the passing of Mr. John C. Bogle who was the founder of Vanguard, and a firm believer in the lost cost, value investing philosophy.